It’s always nice when something you have recorded gets released. I transcribed, arranged and recorded the horns on this funky track by Grinny Grandad. Alto and barytone by me, trumpet by Bob and trombone by Barnaby Davies. If you need horns for your song get in touch! Feel free to share the players as well. The Swing Ninjas second album “Stop Killing The Jazz Man” is out and I’m on it! The release was yesterday at the Mesmerist in Brighton and it was jam packed with swing lovers and lindy hoppers. Check out the Facebook gallery from the night. 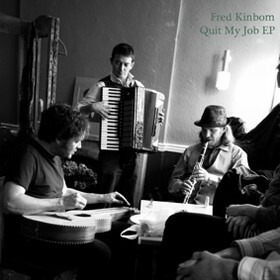 Fred Kinbom’s new EP “Quit My Job” has been released and I’m on it. Both musically and photographically. For some reason all of the bands I’ve played have chosen not to have a band pic on the cover so this is actually the first time my face is used to sell something. Well apart from ABBA the Show of course but then it’s my face just because it looks a bit like Benny’s. Anyway, the EP got a really brill review at whisperinandhollerin, go check it out! It’s on iTunes and CD Baby! The charity single I have worked on with Maria McAteer, that is. The song is a version of Sam Cooke’s classic “A Change Is Gonna Come” and features Maria’s gourgeous vocals, my tinkling piano and beautiful strings played by the Stanford Quartet, humbly arranged by yours truly. All the money made from the sales of this single will go to the charity NACOA (National Association for Children of Alcoholics). Among many other things they provide a helpline for children with alcohol dependent parents to call if they need someone to talk to. I think it’s a wonderful cause. My friend Ian Stephenson have finally finished his solo album “Line Up” that has been eight years in the making. I met Ian when I went to Newcastle in 2006 and I recorded some soprano sax on a jazzy polska he had written. Well, that track “Coming Home” is included. The music on the CD is based in Celtic folk with lots of Scandinavian influences. You can get it here on Ian’s site.